Weather forecasts support local crisis intervention forces in undertaking emergency measures, such as the temporary evacuation of people from flood hazard zones, the removal of movable goods (e.g. cars) from potentially flooded areas, or the dislocation of movable household items from lower floors to upper floors in endangered houses. However, a reliable and precise forecast of an extreme precipitation’s impact is fundamental for these interventions to be a valuable additional flood risk management option. We want to develop a method for “translating” precipitation forecasts to impact-based warning messages. 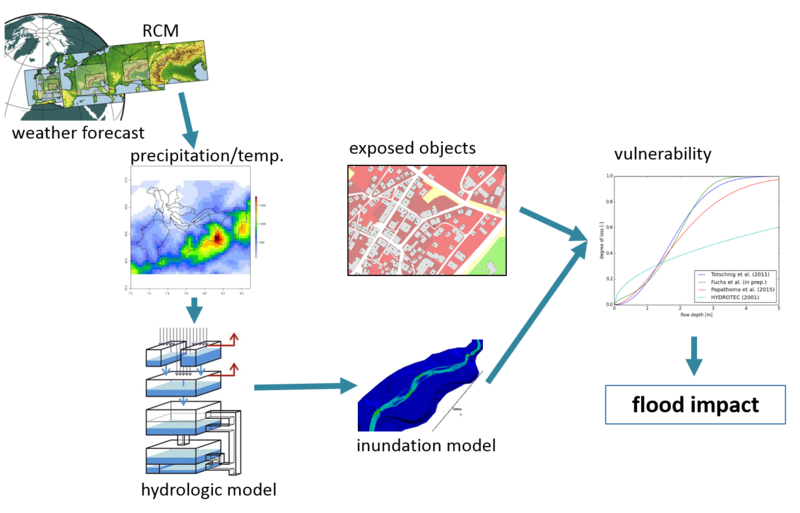 We will develop a prototype for the prediction of the direct consequences of a forecasted rainfall event in the short-term (lead times of 6-24 h), and in particular for the prediction of site-specific flood losses. The development of this method bases on previous experiences of the project “M-AARE Model chain atmosphere-hydraology-hydraulics-flood impacts”. The existing models will be adapted to enable predicting the impacts of river floods, lake floods, and surface water floods 6-24 hours in advance of an expected rainfall event.